Need a shotshell for your lead-free hunting area? 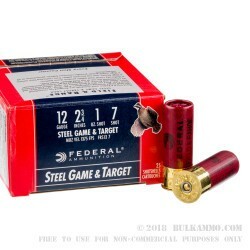 Federal’s Steel Game and Target line features steel shot instead of lead, making for an ideal round for lead-free ranges and hunting areas. 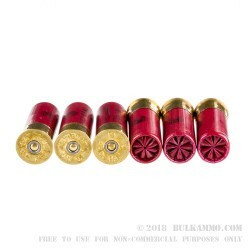 These 12-gauge shotshells have 1 oz of #7 steel shot and are loaded into a 2 ¾” shotgun shell capable of a muzzle velocity of 1375 FPS. The shells feature a high brass hull and a barrel defending shot cup, featuring four petals backed up by a separate gas seal. 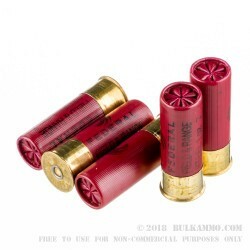 Though a great shell for bird hunting, these steel shot shells make for an excellent sporting clays or target round as well, especially for ranges where water contamination may be an issue. 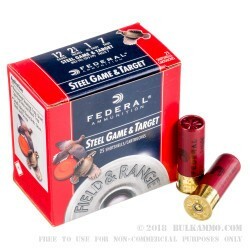 Each box of Federal 12-gauge Steel Game and Target rounds comes with 25 shotshells. Since 1922, Federal has produced ammunition in their Anoka, Minnesota facility. Through the years they have forged a reputation for reliability with their various lines of premium ammunition.